Self-care is a term that is growing in popularity lately and honestly there is good reason for it. As people start healing from chronic illnesses, they are starting to realize the importance of actually caring for oneself properly in the process. We start to realize that we have not been kind to ourselves, physically or mentally. We’ve never been taught that it is ok to love oneself, nor how to actually do this. I’ve put this post together because I think self-care, self-love, and changing our mindset are all incredibly important and these 3 things are all related. Self-care comes in many forms. It doesn’t have to be something time consuming or selfish. It could be something you schedule for 5 minutes a day, or something that lasts for much longer just once a week. It could be something as simple as quiet time in a bath, or as complex as going on a trip. Find a healing protocol to start and stick with- HTMA is always my favorite to start with. And honestly, this isn’t just plug because we offer these. I truly feel like getting on a solid plan with someone that will help you along the way is one of the best self-care techniques you can use. We all need someone else to guide us and give us a plan on where to start. Find a hobby- this is something that tends to get pushed aside when we get sick. Find something that you LOVE to do and try to do it daily, even if it is just 5 minutes. Painting, reading, learning instruments, learning languages, swimming, etc. The list is endless here. If you enjoy it, find a way to add it in. Limit your social media exposure, or unfollow pages that stress you out! Be silly! Laugh! Look at funny videos on YouTube, play with your kids, watch a funny movie you like- laughing truly is a medicine. Check out my friend Lindsey’s post on her tips for Rest-Ober too for more self-care ideas. I feel like this is different from self-care in many ways. Self-care is the actual action of doing things that you know you need to do in order to heal and take care of yourself. Self-love is accepting that you are worth the time and energy you’re putting into yourself. You DESERVE self-care. In a world where we are bombarded with messages that people are not thin enough, pretty enough, smart enough, etc- it’s time to start realizing that WE are in control of how we view ourselves and outside opinions are not needed. The moment we stop caring about how other people view us is the moment we can start appreciating ourselves for how we are. This is not to say that we shouldn’t work on improving ourselves in various ways if you want to! If you want to lose weight, get more muscular, dye your hair, do your nails, learn a new language, go back to school, etc then go for it! But do it because it makes you happy and because you truly want to do it, not because others are telling you that you should. Be in control of yourself- mind, body, and soul. Recently, this message has become even more near and dear to me thanks to a band I have found that has this same message. Their last few albums have literally followed a timeline of how we can learn to love ourselves and how we can learn to speak for ourselves. Over the last few months, I have really been focusing on my own self-love and healing from the emotional trauma I’ve dealt with in my life. Finding this group has been an absolute blessing- I love music to begin with and it incredibly healing for me, so finding music with meaning that is created by a band that actually cares about their fans has been life changing to say the least. If you want to check them out, this is their Youtube channel (and yes it is BTS- I’m sure many of you are starting to learn about them since they’ve actually been on many of our mainstream TV shows lately!). It can be hard to be positive when you are dealing with any sort of chronic illness. Trust me, I really understand. Saying things like you’ll never heal, nothing ever works for you, you hate your body, you give up, etc aren’t helpful. The more you say these things, the more your body will believe them and the harder it can be to heal. If you need to release emotions as you heal, that is one thing. That should be short lived and you should feel better afterwards. It is the negativity 24/7, 365 that needs to be re-evaluated and changed. I find that many people don’t even realize they are in a negative mindset until someone else points it out to them too. So think about it- how do you speak to yourself? Are you constantly putting yourself down? Angry that your body won’t cooperate? Taking your emotions out on others because of how frustrated you are? Observe the way you think and act for a few days and start to make note about how you can change. Instead of focusing on the foods or supplements you cannot tolerate, focus on what you can tolerate. Remind yourself that your body will heal and eventually you will be able to get rid of many intolerances. Just observe your thoughts, words, and actions and see what you can do to start making them more positive. This is not an overnight change at all. This change can take lots of patience and practice to put into effect. But the effort is well worth it as you retrain your mind to be more positive. Remind yourself that this is temporary! This is an especially important one to remember. It takes years, decades, or generations to build up these chronic illnesses. Throw in years of the SAD lifestyle, chronic stress, heavy metals, birth control pills, vaccines, etc and it is no wonder why so many people are dealing with adrenal exhaustion these days. 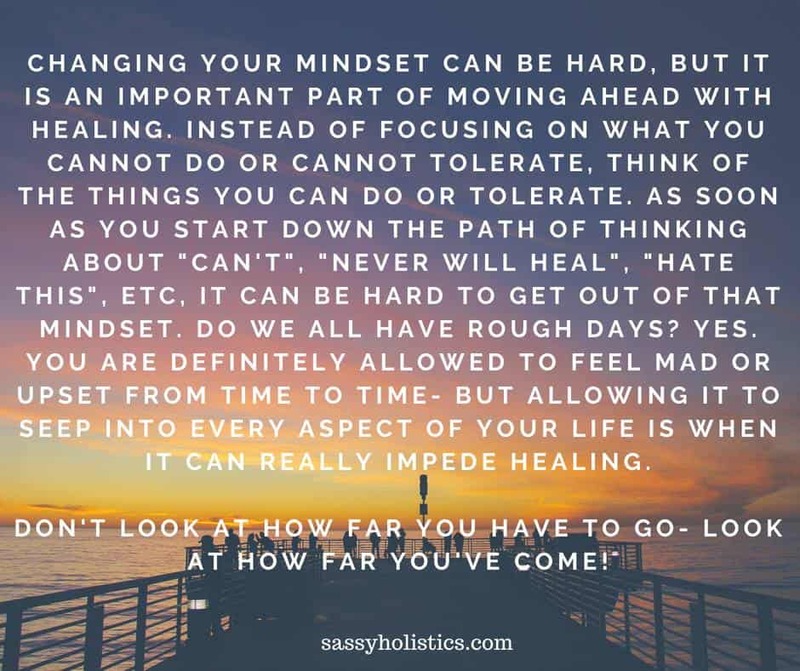 It will take time for you to fully heal! The general rule of thumb is one month of healing for every year you have been sick. Just stay strong! You can allow yourself some time to experience the frustration, anger, and sadness but remember to pick yourself back up and keep on pushing!